For the first time this season, the Houston Rockets seem to have momentum on their side. After a brutal 1-5 start to the season, the Rockets have turned around to win 5 out of the last 7 and haven't looked better than their last two games against the Indiana Pacers and the Denver Nuggets. These are the signs of life that the team and the fans have been hoping for, and the Rockets now have the chance to build upon some success instead of just recovering from failure. Chris Paul (21 points, 5 rebounds, 4 assists) looked great. James Harden was getting the team involved to the tune of 11 assists, and recovered from a slow first half by ending the evening with 22 points. James Ennis had his first particularly impressive night with 16 points on 8 shots. Clint Capela was a beast on lobs and shot 11-15 on the night. PJ Tucker anchored some impressive defense, shot 4-7 and played 40 minutes despite battling illness. This is all to say: last year's Rockets showed up. Whether there's a way to recapture that groove they had last year has yet to be seen, but this outing was easily the closest they've come. The passes were crisp, not only the ball but players were also moving. Switches and help were coordinated. The Rockets held a team under 100 points, despite the Nuggets shooting 50% from the field, largely due to the 16 turnovers they worked to cause. On a night when both teams were hot, neither shot over 76 field goals. 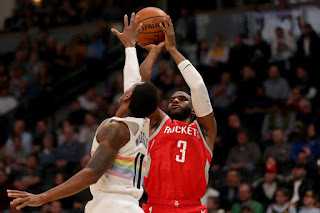 It was a bizarre game in which the Rockets seemed to gradually crush the life out of the opponent with whatever tools they had to. It was very familiar in a good way for Houston. The hope for the Rockets has been that their awful start was just a bad start and not an indicator who they are now. The seemingly imminent departure of Carmelo Anthony perhaps has relieved some of the pressure or at least shaken things up enough for the team to have slipped some shackles. The last few games are, with the exception of a truly grim loss to the Oklahoma City Thunder, cause for optimism. Either their first 6 games were the aberration, or the last 7 are. For those who would like some reason for hope, I present a screenshot of a 13-game stretch last season in which the Rockets went 6-7. Hilariously, the next game after this was also a loss. Of course, the rest of th season for Houston was 59-10, which would be an incredible and unlikely result for the rest of this season. It does, however, illustrate that all may not be lost. Yes, this excerpt of last season included an extended absence for James Harden, but the current stretch has also featured missed games by Harden and Paul as well as various injuries to role players. It's still too soon to declare the Rockets back or doomed or anywhere in between, but now there's at least some good evidence that it may be better from here on. Now, all the Rockets have to do is beat the Golden State Warriors next game to secure a three game win streak. How hard could that be?